I've seen "Halo" or "Flip-In" hair extensions on youtube and blogs for a while now. I was incredibly interested because I have thin fine hair that doesn't hold clip-in extensions well. I love the fullness and extra length of extensions especially for going out at night. The halo extensions I was seeing online retailed for over $300 a set, which is too much for me to invest in something that I am only going to wear occasionally. I watched several tutorials and decided to blend different techniques I had seen to create my own custom halo extensions. I love the result. The are light and much more comfortable than any clip-in extensions I've used in the past. This method is cheap, easy, and fast to make. They fit secure to your head and are so easy to take out. You literally grab the ends of your extensions and pull them up over your head to remove. You are getting 100% custom measured extensions that you know will fit you perfectly. 1. 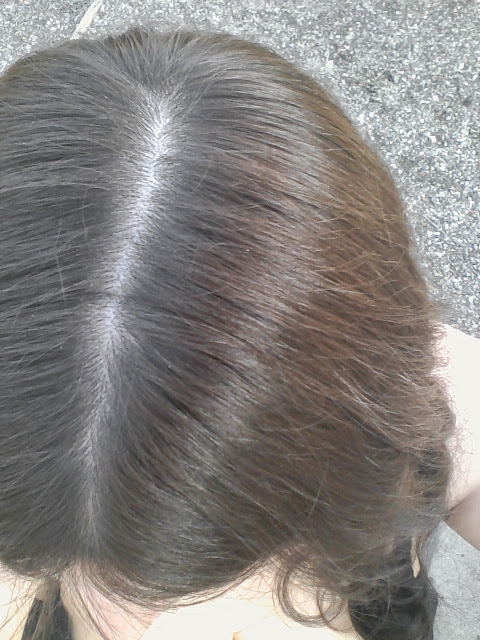 I purchased one continuous weft of Sassy Silky Straight 18" Human Hair Extensions (mine are in dark brown) and Proclaim Super Bond Hair Glue (in dark, use white for blond hair) from Sally Beauty Supply. I picked up some clear monofilament jewelry cord from Wal-mart for a couple dollars. 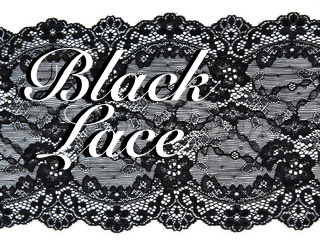 You will also need thread matching the colour of the hair, a needle, and a pair of scissors. The one package of hair plus all the supplies cost under $100 and made two sets of extensions. 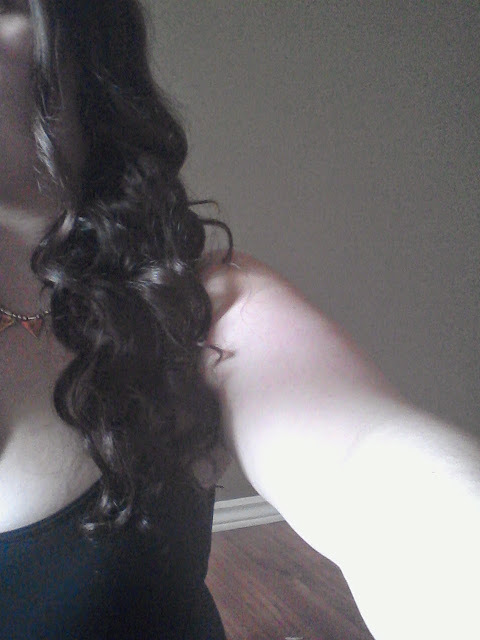 I keep one set in tight curls (pictured) and the other set in loose waves. 2. Measure the weft of hair slightly above the middle of your ear on both sides so the band of the extensions fits comfortably under the slope of your scull. Cut the weft to size. 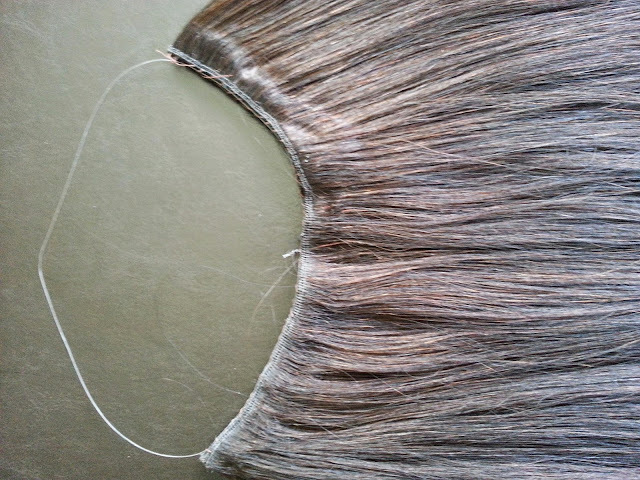 Use the length of the first weft to cut more wefts of hair to the same length. I used 3 wefts of hair for each set of extensions, but you can use more for a fuller look if you have thicker hair. 3. Face the thinner side of the band of the wefts of the hair extensions down. Run a thin line of the bonding glue along the thick side of the band. Place a second weft of extension on top of the first weft with the smaller band down. Let the glue dry, it will only take a few minutes. 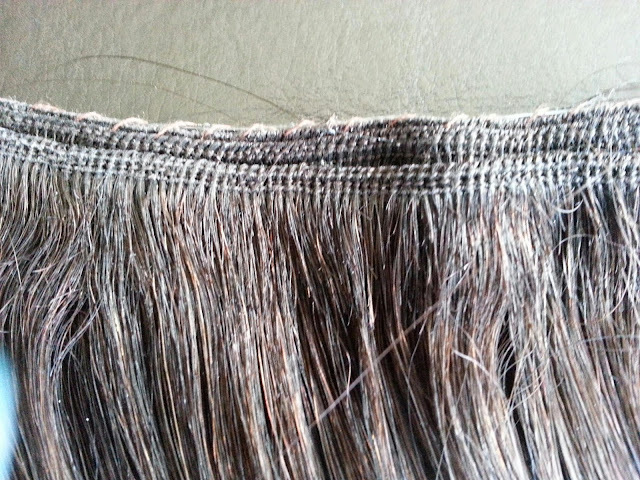 Still working on the same side, run a line of bonding glue just below the band of the double weft of extensions. Place the thick side of the band of the third weft just below the double weft band. Let glue dry. 4. Use the needle and thread to create a light running stitch along the top of the double weft to create a barrier to hold the halo wire in place in between the two bands. 5. Cut a long piece of the monofilament wire and use the needle to thread one of end of the wire through the stitching to the middle of the weft. Take the other side of the wire and do the same at the other side of the weft. 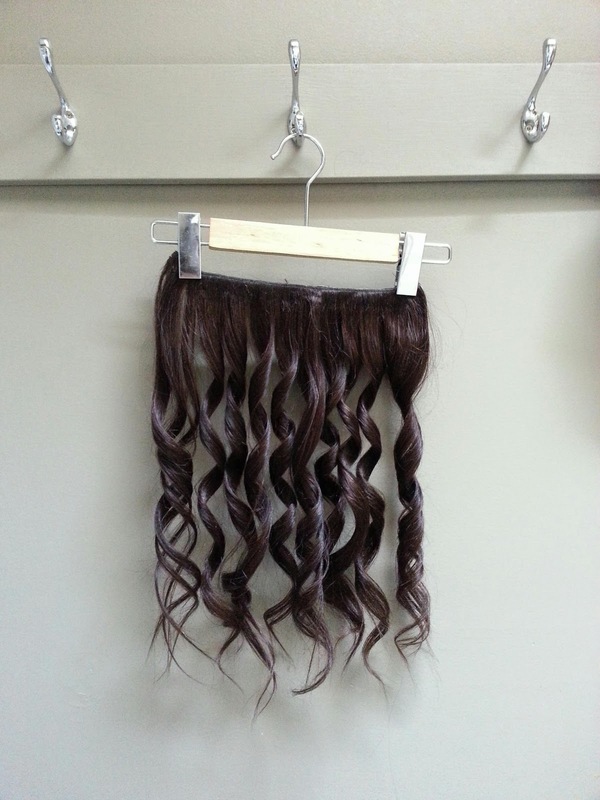 You will end up with a drawstring in the middle of the back of the extensions. 6. Fit the halo to your head holding the drawstrings in one hand. Make sure the extensions fit tight and comfortably on your head. When you're happy with the fit tie the drawstring. Use the scissors to cut off the excess wire. Overtime the wire will stretch but you can easily tighten it but tying a new knot. 7. Place the halo back on your head and make any adjustments. When it's comfortable, use the pointy end of a rattail comb to pull sections of hair over the weft and halo. Once you have pulled enough hair over the halo it will be hidden. Brush hair together to blend extensions. 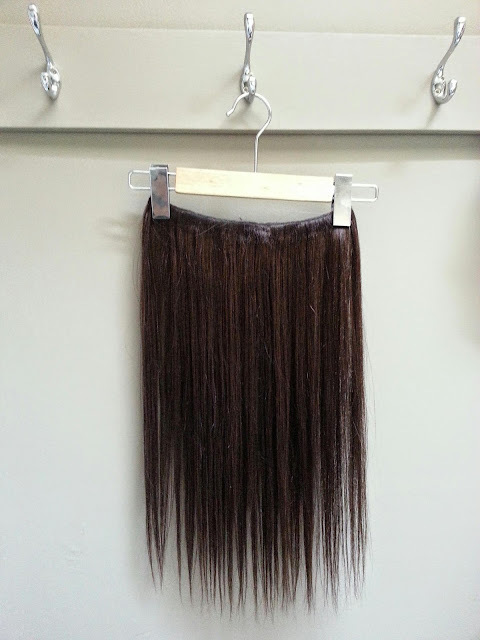 I store and style the extensions on a pant hanger. For the tight curled extensions I used a small conical wand to curl hair away from my face, let the hair cool, and brushed it out with a tangle teaser. You can only barely make out the clear wire of the halo in direct sunlight. It is incredibly easy to blend in to your part and hide. So the 3th weft needs to be glued ON the hair, down the 2nd weft? I have go through your site,If you want to know more about this please visit our blog:-The Cheap Remy Hair Extensions are needed for the whole time. It is also true that the Cheap Clip In Hair Extensions can be purchased online. 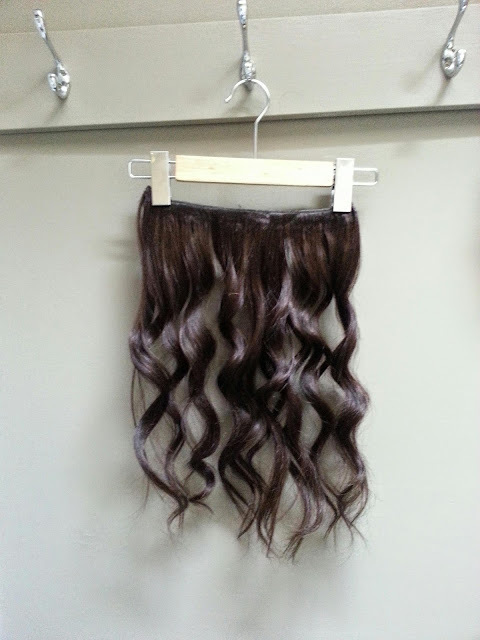 The Remy Hair Extensions Clip In will be needed by those who are in the business of taking care of one’s appearance. The Clip In Hair Extensions are needed by all those who want to participate in various beauty contests as well. There are many companies offering moving and storage services but only a few of them can exceed their customer expectations. Our company provides moving and storage services in Los Angeles County, Brazilian hair extensions Shop our site for Virgin Hair Extensions. We carry Brazilian Hair, Malaysian Hair, Peruvian Hair, Nano-Ring Extensions and Clip-In Hair Extensions. Those hair extensions look great on you! It's great that they are very realistic nowadays, and you can barely even notice it on some people who are wearing them. Anyway, thanks for sharing these procedures with us, Elise. This will be very useful for people out there who are planning to try hair extensions for the first time. All the best! This is a Great post.For getting more information about Clip in extensions please visit us. Wow! I really like this hair extension. Wholesale hair extensions suppliers are now very popular in online where extensions are sold at very reasonable price. This is a very profitable business and very popular nowadays.